Over the year, I try out a LOT of products. Some I immediately fall in love with and others have me happy to finish them! I'm trying to include more natural products into my beauty routine and without a doubt, the Trilogy Botanic Lightening Treatment was my favourite discovery of 2015. I was worried that I would struggle to find a natural serum that would reduced my pigmentation (which sadly increased due to pregnancy) and this did the trick. It could easily out perform chemical based serums! I was originally sent this as a PR sample, but I purchased this once that ran out. 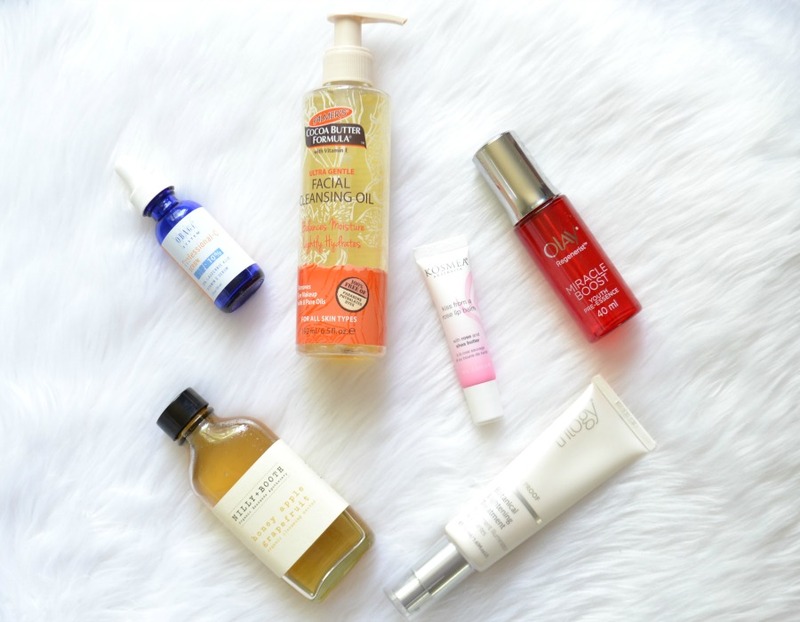 I love using oil cleansers and balms, but there's not a lot of options available that are easily accessible and affordable. But this year 2 entered the market. There is the Swisse Moringa Cleansing Oil (which I've only just recently tried) and a favourite discovery, the Palmer's Ultra Gentle Facial Cleansing Oil. It has that beautiful Palmer's scent. It removes my make up quickly and easily. If you have never tried an oil, pick this one up as it's free of mineral oil and parabens and it's under $15. One of the most interesting cleansers that I've ever used was the Nilly + Booth Honey Apple Grapefruit Organic Cleansing Nectar. It doesn't foam like your normal cleanser. It has a thin, non sticky honey consistency. There's a very small ingredient list in it that's all natural. I'd recommend this to anyone looking for a natural product. Another product that was really unusual to use was the Olay Regenerist Miracle Boost Youth Pre-Essence. I was expecting it to be similar to the SK-II Facial Treatment Essence as you apply it after you cleanse and before your serum to help boost your serum and moisturiser, but the Olay Essence is actually a lightweight gel. I didn't really notice how important this was until I stopped using it. I've purchased 2 of these now. I really fell in love with Coast To Coast products this year (which I've previously reviewed here) but it was the Coast To Coast Skin Whitening Facial Polish (not pictured) that won my heart. It smells incredible and it leaves my skin feeling so soft and smooth. David Jones currently has Coast To Coast 30% off, so I need to go pick one up asap. Due to my pigmentation, I've tried out a lot of serums but without a doubt the Obagi Professional-C Serum* is in my top 5. When I used this, my skin looked radiant and glowed. I had the 10% version, but there's also a 15% and 20% available. I want to try out the other versions soon as pregnancy made my pigmentation worse. Lipbalm is a must for me and the new Kosmea Kiss From A Rose Lip Balm is so good that I bought a back up before I had even finished my first one! It has the most amazing rose scent and it really moisturises my lips. 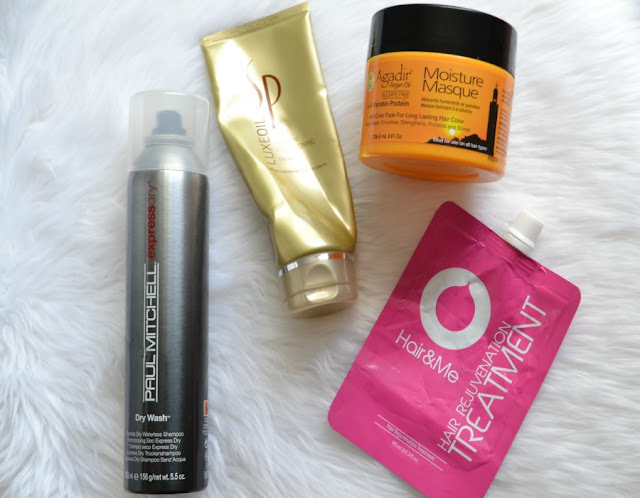 The Wella LuxeOil range is AMAZING (especially their mask and oil) and last year they released a conditioner. The Wella LuxeOil Keratin Conditioning Cream* gives you a lot of hydration in only a minute. This is the conditioner that I love to use when I don't have time for a mask. I've really enjoyed using a pre-wash hair treatment and the Hair&Me Hair Rejuvenation Treatment is fantastic. I've been sent 1 and have bought 2 more. They've just released a new mask and they're selling a bundle here with the new mask and the original one that I'll be ordering very soon. I bought the Agadir Argan Oil Moisture Masque at the last Priceline haircare sale and I fell in love with it from the very first use. It's thick but melts into my hair quickly. In 5 minutes it leaves my hair feeling incredibly soft and smooth. Because it's keratin based, I would use it every second wash to make sure I wasn't using too much keratin. If I could get one beauty product for free for the rest of my life it would be this!! The Paul Mitchell Express Dry Dry Wash* dry shampoo is life changing!! It's a fine dry shampoo that sprays like a hairspray (lightly on your hair) so you don't get a build up of dry shampoo even when you're on day 4 or 5. Even though it's fine in texture, it gets rid of any oil on your scalp. Run out and get this!! I've tried a lot of foundation brushes, but the By Terry Soft Oval Expert Brush has to be one of the best. Its unusual shape and look makes it so easy to use, especially around your eyes and nose. It's sold out instore and online in Mecca but if you see it, pick one up. You won't regret it! I purchased both the Covergirl The Super Sizer Mascara and the Ready Set Gorgeous Foundation when it was half price at Woolworths. The mascara is amazing as it gives my lashes definition, length and size. It's also one of the only mascaras that doesn't smudge. The foundation is a great affordable option. It can be used to give you a light or full coverage look. I've used it with my hands, with a sponge and the By Terry brush and each technique looks amazing. I love reaching for the Max Factor Creme Puff Blush in "Lovely Pink" on days when the pigmentation on my cheeks are playing up. This helps to give me some colour without making my cheeks look even redder. It also gives me a beautiful glow. And finally I like to set my make up with the Napoleon Perdis Auto Pilot Moisture Mist. It feels incredibly refreshing on my skin and it's actually a mist unlike other setting sprays. It also has a beautiful and relaxing fragrance. I've got a back up of this as I don't want to be without it! 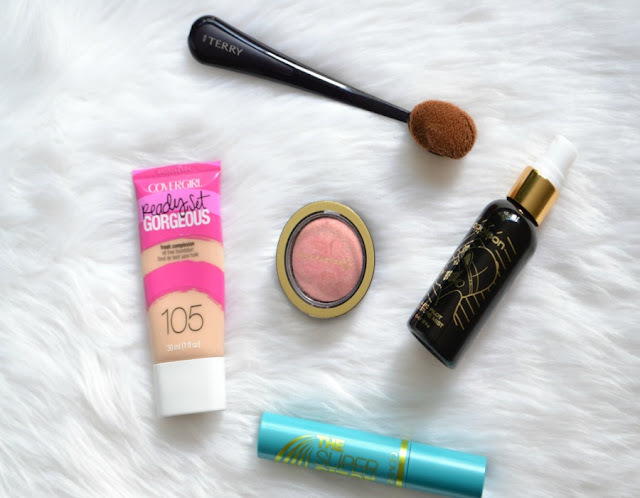 And those are some of my most loved products from 2015. What would you recommend me try in 2016? I really want to try the cleansing oil once I finish my current one. Oohh that By Terry brush looks quite interesting. I've seen these types of brushes on YT and thought they were funny looking haha. I can't believe it works so well! The brush is awesome. It makes my skin look airbrushed. I want to try out that brush! It looks gorgeous! It's so pretty! I now want to try the Artis Brushes too. And the By Terry brush, such a strange lookin' brush! I've been so out of the blogosphere, haha, this is my first time seeing such a thing! The mascara is an all in one mascara as it gives me length and thickness. how do you use the brush? The videos i have seen of the Artis say to use it like a hair brush and sort of sweep product down. Do you dot foundation around the face then buff or sweep? Or do you dip brush into foundation on back of hand and then buff into face?